EPA-DHA Balance contains pharmaceutical grade, ultra-purified and highly concentrated omega-3 fatty acids from fish oil. 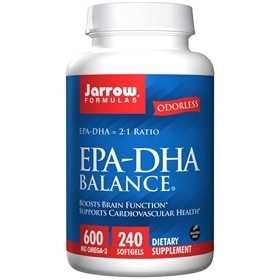 EPA and DHA support cardiovascular and brain function, enhance joint mobility and promote positive mood. Natural strawberry flavor and mixed natural tocopherols (from soy). Softgel consists of gelatin, glycerin and water.